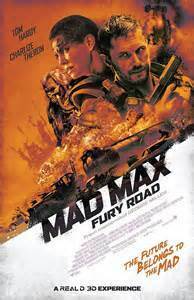 As of today “Mad Max: Fury Road” holds the title for ‘the loudest movie of 2015’ though from what I saw of summer previews it may not hold it for too long! It has been 30 years since the original Mad Max trilogy and memory may be wrong but I remember a deeper and more involving story along with a young Mel Gibson showing more emotion than the current Max played by Tom Hardy. I have heard and read a lot about Mr. Hardy in the past couple of years but I think I have only seen him in two movies those being “Inception” and “Dark Knight Rises” but I have no recollection of him in either. The camera gives him a lot of close ups in this film so I am sure I will recognize him in future films. Getting an equal amount of face time, if not a little more, and the only reason I went to see this film is Charlize Theron, who plays Imperator Furiosa, looks great even with a dirty face, raccoon eye makeup, short cropped black hair and a mechanical left hand and is the equal, if not better, than any man hero! Her eyes are a movie, without CGI effects, on their own. The first five minutes of “Mad Max: Fury Road” are quiet and then the incessant loud music, the races, car chases, one action scene after another begin to wear the audience down. Within a 2 hour movie there might be 15 minutes total without mayhem in every form possible. It reached a point that I was wondering how many scenes were done in front of a green screen, how many were fake, how many were performed by stunt people all the while that long music ruled by drums fills the auditorium. There is one remarkable scene of just Hardy raising up from the desert sand that made me think “WOW”! With a huge cast the standouts are Theron, Nathan Jones, Nicholas Hoult, the 5 wives, especially Riley Keough and trust me, you won’t want to meet any of the female sexagenarians in a dark alley or the desert! The direction by George Miller offers every action fans dreams while the screenplay by Miller, Brendan McCarthy and Nico Lathouris is simple. It is said Miller already has the next Mad Max film prepped named Furiosa and, if true, I hope it brings back Theron.